Every once in a while, I think I have GOT to write a book called “The Twitter Diet” although I think there already is such a thing. But sometimes I am just overwhelmed with the incredibly community and power that is the Fitbloggin’/FitTwitter world. Just last week I blogged about needing more accountability and consistency in my fitness life. My buddy Kris responded, “Me too!” and just like that, a little thread of accountability was spun between us. And every day we check in on each other. We had an energetic holiday weekend and cheered each other on with all kind of high fives, but then…. we went back to work today. Both of us were feeling a certain degree of stress and “how are we going to do this?” When I got home from work it was hot and I was tired. And I needed to make dinner and and and…..
Then Kris Tweeted, “8pm. Twenty minutes of ANYthing.” And there it was. My accountability. She lives over 200 miles away from me and yet she is my exercise buddy. Which I already established that I really NEED. So I hemmed and hawed after dinner “I’m really full!” but then it was 7:49 and 7:55 and I said, “I’m putting on my shoes.” She wrote, “No fancy exercise clothes, just regular shorts.” Which was what I was wearing, too. I told Mr. McBody I was taking a walk. He had a look of consternation on his face. He worries about mountain lions. When I got up to the park it was half full of cars (which is a lot for 8pm!). Lots of people and dogs had been waiting for it to cool down. 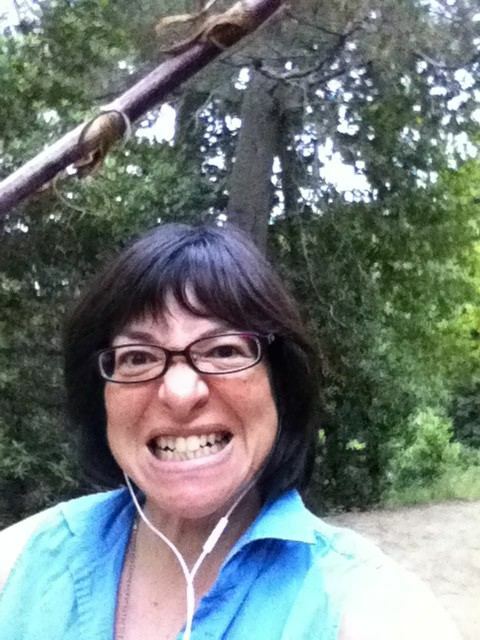 I headed up the trail carrying a big stick anyway, and I whistled loudly and out of tune to my iPod. I had a great walk. I went 1.75 miles in 35 minutes, which was more than the “twenty minutes of anything” I was hoping to accopmplish. I even jogged a tiny bit and worked up some sheen. While I was out on my walk, I saw that Deb had also joined us from her own location. Three friends walking together simultaneously, many miles apart! 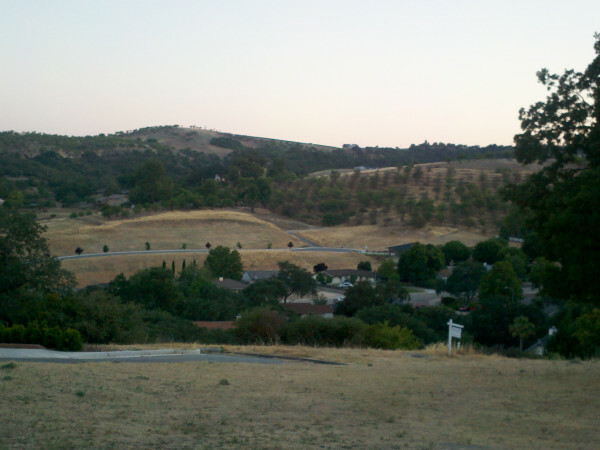 Kris sent a photo of the view from her hill. This, my friends, is the best of what technology has to offer. It shrinks worlds and allows connection, not just between people glued to their computer screens, but out in the world, on the trail, getting healthy together/apart. I know tonight that if it were not for my friend 200 miles away, I would NOT have put on those shoes and gone into the woods. There were just too many reasons NOT to. But I did it and feel so grateful and glad. I’m overwhelmed by this every day. The whole freakin’ world is shrinked in my Iphone. I can “talk” to people far far away from me, create bonds, and fuel my fitness mojo on a daily basis! This… wasn’t real 5 years ago. Truly amazing! Tell me about it, Reinaldo! When I think, I learned how to improve my swimming form from a guy in Peru!! LOL (thank you again). this is so awesome, and I will DEFINITELY be there for the next one! weeee! you KNOW I so so so agree. and love Kris and all her KRAZINESS as well. That is so awesome. Love that Kris. And whoa, the POWAH of the Twitternets!!! I must concur with you and your lovely commenters… words like “overwhelming” and “mind-boggling” come mind when I think about the support and community out there. And unless you’re part of it, you can’t really understand it unfortunately! that’s cool. i love the internet. I’m new to all this I love it! I agree 100%, the fit blog/tweet community is amazing! I feel very grateful and happy to be part of it. Enjoy the rest of your weekend!! !